The image to the left from 6th century Croatia, shows Mary visiting Elizabeth during their pregnancies. 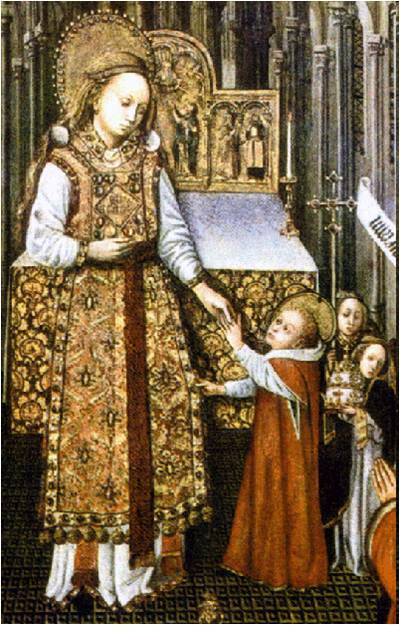 Both women are wearing what look to be chasubles with the pallium visibe beneath, denoting the highest priestly honour, worn only by the Pope or Bishop as a privilege. It has been said that Mary baptised and confirmed John the Baptist in the womb of Elizabeth. Jean-Jacques Olier, contemporary of St Vincent de Paul in the 17th Century, says of the Visitation to Elizabeth, “The Blessed Virgin, as Bishop in the Church, sanctified the son of the high priest Zachariah. She sanctified St. John and through the imposition of her power, using her right as Mother of God and spouse of the Father, she imprinted the Holy Spirit on St. John”. 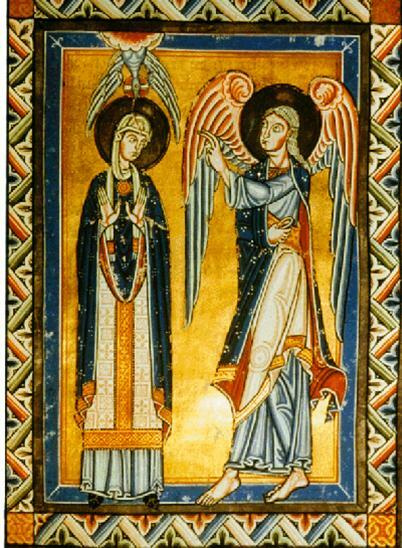 The image on the right is from 12th century Germany. Our Lady is dressed in chasuble and stole as the Angel Gabriel speaks and the Holy Spirit descends. In 1906, Pope Pius X approved a prayer which says “Mary, Virgin Priest, pray for us.” However, a Holy Office decree of 1916 forbade the use of any image that had Mary wearing vestments – some say for fear of the possibilty of an argument for women’s ordination, others that Mary as a priest was a metaphorical image taken too far. The image of Mary as a priest, however it is received, is a powerful one. It challenges the view of Mary, meek and mild with the idea that in Mary’s submission to the will of God, to her vocation, she becomes the model of priesthood – a powerful woman, the High Priest after her Son. And who becomes so because she is a woman. If fundamental to the priesthood is the priest being the intermediary, bringing the people to God and God to the people, Mary must be the ultimate example of this through her motherhood, bearing God in her womb. This speaks of the extraordinary relationship between God and humanity in the Incarnation – the flesh and the blood crucified for the redemption of the world, was Mary’s flesh and blood, fully God’s son and fully Mary’s child. As his mother, she offered her son to the world as the Father offered his Son. This entry was posted in Anglican, Anglo Catholic, Art, Catholic, Christianity, Saints and tagged Mary, Priest. Bookmark the permalink. There is no evidence of Mary being ordained a priest by Jesus Christ. She herself did not found any church. Even though I personally do not have problems with calling Mary ‘virgin priest’, or acknowledging her as a ‘model of priesthood’, I believe she was a good example and the channel for the virtue and grace of the priesthood. There’s no evidence of Jesus, a Jew, ordaining anyone. From one perspective this is a nice concept. I think the idea of annunciation qua ordination is just brilliant. I am sure Augustine would happily cite this as a sacrament. In fact a theologian could spend many an hour pontificating on the role of virginity and the priesthood. As such a Catholic reading of Mary as priest is a useful if not tricky concept. As is suggested, the politics of the church could be questioned but as I am not Catholic I can not comment. I like the idea of Mary baptising JtB in the womb. As JtB cried out “He who comes after me ranks ahead of me because he was before me” (Jn 1:15). Prolepsis indeed, but is that changed with Mary as priest? The original is in the Louvre, and is called ‘Le Sacerdoce de la Vierge’ of the School of Amiens (1437). The website to which that links gives an interpretation of the painting, but also raises some further questions. If you look at the hand positions of Mary in the Michaelangelo “Pieta”, they look a great deal like those of a priest at Mass. It is subtle, but it is there. When Our Lady and Saint Joseph brought the infant Jesus to the Temple for the Presentation, they offered the Miracle Child, Body and Blood, Soul and Divinity… the only Begotten Son of God. It was the first Offertory. A foretaste of the Eucharistic Feast. I also wrote about her in a poem/ blog post called Holy Gifts, on the same site. 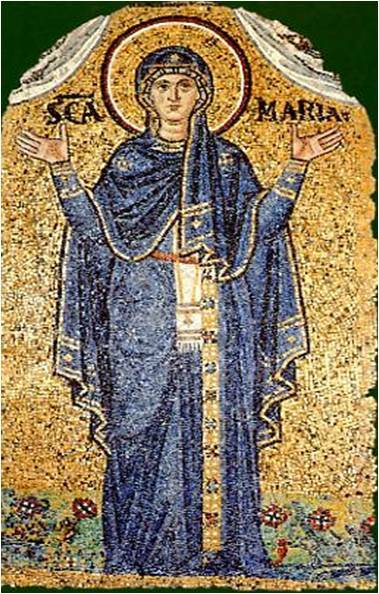 There is documentation in the early church (by the church fathers) that they considered Mary a priest. It was only in the early 19th century that was changed. There is also more and more evidence coming forth that there were women priests, deacons and bishops in the early church. Christ sent followers out, both men and women. He continues to do that today, both men and women, as priests, deacons, and bishops. He sends all out to love God above all else and to love one another. I am not closed that this could be a possibility, in some way, but the chasuble angle doesn’t do it for me (I wrote my Master’s thesis on the restoration of the Permanent Diaconate for Women in the RCC). First off I would need more confirmation about the existence of the painting and its alleged age of 6th Century. Even if the painting does exist and is that old, artists painted what they wanted to paint. IMHO, the apparent artist rendering of Mary and Elizabeth wearing chasubles is just that an artist rendering.